Mouser Electronics, Inc., the industry’s leading New Product Introduction (NPI) distributor with the widest selection of semiconductors and electronic components, is excited to offer “winning combinations” from Renesas Electronics and IDT, a Renesas Company, following successful completion of Renesas’ acquisition of IDT on March 29, 2019. Renesas and IDT offer complementary product portfolios that come together to create a wide range of comprehensive solutions. These winning combinations capture and highlight the technological advantages of Renesas and IDT in the fast-growing industrial and infrastructure applications for the data economy. IDT’s industry-leading radio frequency (RF) products, high-performance timing, memory interface, real-time interconnect, optical interconnect, power and sensor solutions, combined with Renesas’ microcontrollers, system-on-chips (SoCs), and power management ICs, present myriad solutions for customers. Winning combinations for industrial applications include HVAC air quality sensor and air quality control solutions, which incorporate the IDT ZMOD4410 gas sensor and HS300x humidity sensor family, along with the Renesas RL78/G14 microcontroller to provide a complete solution for HVAC systems, smart appliances, and smart home/office applications. To support industrial automation applications, the Industrial sensing with IO-Link interface includes Renesas’ industry-leading RL78 microcontroller, and IDT’s best-in-class ZSSC3224 sensor signal conditioner and ZIOL2401 IO-Link interface for a complete solution. For infrastructure applications, the cellular base station is a combination of a wide range of bias control DCPs, voltage references, digital converters, and highly integrated and industry-proven timing tree solutions. Wireline infrastructure computing is timing and power solutions that reduce component count and logistics for applications like 10G – 400G Ethernet switches, enterprise core, edge routers, optical transport networks, packet transport networks, and access network equipment. 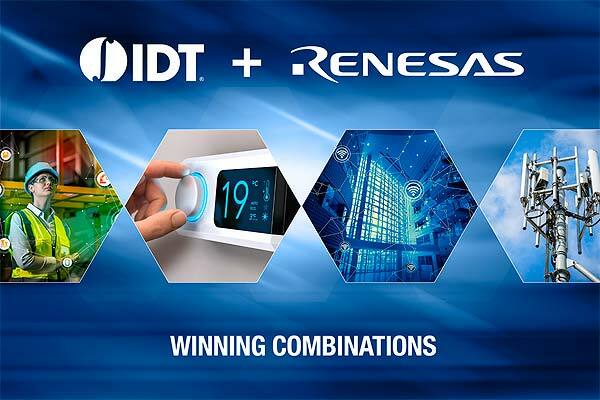 To learn more about winning combinations from Renesas and IDT, visit www.mouser.com/idt-renesas-winning-combinations. Considering Home Wireless Connected Lighting?